The squadron was originally chartered in the early 1960's as Suffolk Cadet Squadron VI. 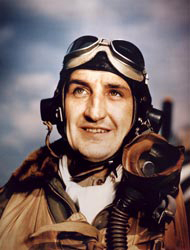 In 1979, Joy Nelson, the unit's commander, approached the World War II and Korean War Ace Col. Francis S. Gabreski and requested his permission to rename the squadron in his name. He graciously agreed and the squadron was renamed. In 1993, the squadron began participating in the decoration of graves at Calverton National Cemetery. Shortly therafter, Col. Gabreski's wife passed away and was interred at Calverton Cemetery. Maj. James Hirsch received a request from Col. Gabreski to remember his wife during the annual Memorial Day decoration event. Col. Gabreski has since passed and is interred with his wife in Area 14 at Calverton. The squadron has honored Col. Gabreski each year during the Memorial Day Weekend when the unit's color guard folds an American Flag in his honor and members of the squadron decorate his grave with an American Flag. For more information about Col. Francis S. Gabreski, click here.